LANGLEY, BC – Trading Post Brewing has announced the the upcoming release of a new beer created in collaboration with award-winning chef Vikram Vij. Vikram’s Weissen is an amalgamation of his love of traveling and a passion for pairing Indian cuisine with drinks that complement the exotic spices and the aromas. Working closely with Brewmaster Tony Dewald at Trading Post Brewing, Vij creates an unparalleled brew that not only pairs perfectly with your favourite curry, but one that will awaken your taste buds. Saaz hops, coriander and orange, purest water, total passion and lots of love come together for this exciting brew. 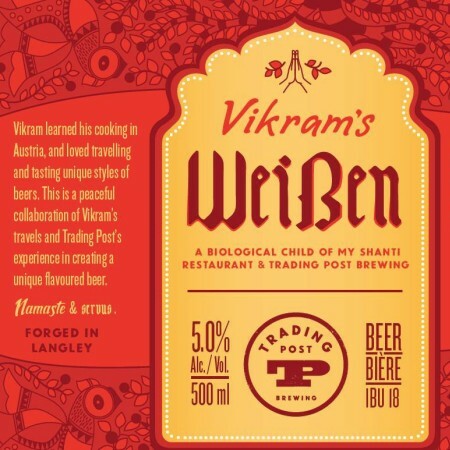 The launch event for Vikram’s Weissen will take place next Monday September 18th at the Trading Post Taphouse & Eatery (9143 Glover Road, Fort Langley). The $25 admission (tickets available online) includes a 500 ml bottle of the new beer, and a grazing menu created by chefs from Vij’s My Shanti restaurant and the Trading Post kitchen. Vikram’s Weissen will be available at Trading Post and My Shanti, with plans to expand soon to Vij’s other restaurants, Vij’s and Rangoli. Liquor store distribution is also being considered for the future.